Although Gov. 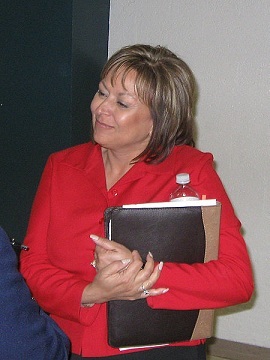 Susana Martinez repeatedly has disavowed any interest in being on the national Republican ticket, the GOP's last presidential candidate, former Massachusetts Gov. Mitt Romney just mentioned her as a possible contender. Not for vice president. He's talking leader of the free world, commander-in-chief, the top job. “Right now, we've got a very full group of people — Marco Rubio; Jeb Bush; Chris Christie; Rand Paul; Paul Ryan, of course, my running mate, an extraordinary man; John Kasich, governor of Ohio, doing a great job there; Scott Walker in Wisconsin,” Romney said. Last year, Martinez said the time for a female president is “long past due.” But when asked if she would consider running on the national ticket, she said she was "focused on New Mexico." In 2012, Martinez said serving as the guardian of her developmentally disabled sister would prevent her from living away from New Mexico. And this basically is what Team Susana has told me and the rest of the New Mexico political media. But as I've written before, such speculation is not likely to stop, especially if she wins reelection this year. Is the Minimum Wage Amendment DOA in the House? Some Action in the Senate Today?